Dutch artist Rob Scholte, born in Amsterdam (1958), composes with images – gives a new sense to existing material which was stripped from its relevance to the modern day spectator as they no longer fit a certain context. Rob Scholte organises and places these new compositions into a new perspective and connection, rekindling their originality whilst maintaining their initial definition. Contrasts and clashes which could be found in the original works, are often surmounted in Scholte’s interpretations through a use of relativism and irony typical for the 20th century. 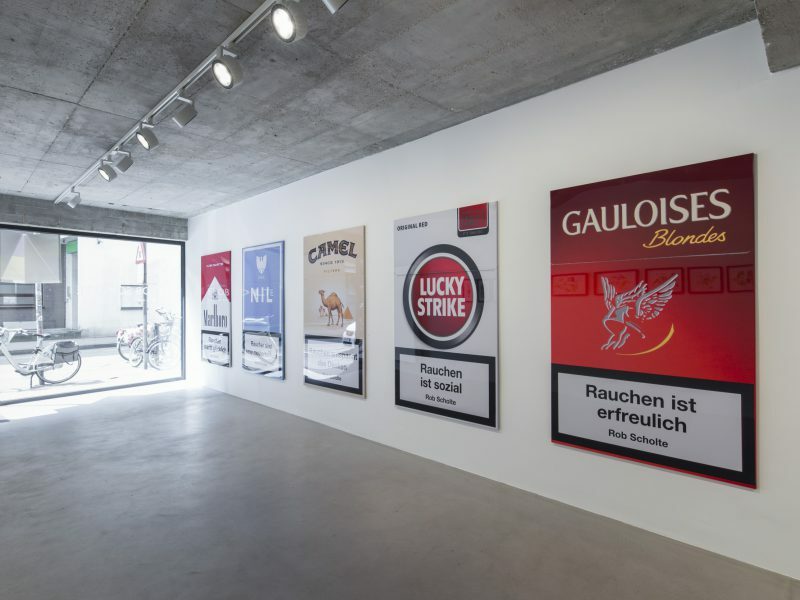 He finds inspiration partly in in his personal, thematic archives, but even more so in the media – which he criticises for its manipulating and objectivating tendencies. In the visual era in which we live, we are flooded by images that shape and kneed us: we think we need images to feed our dreams and/or fantasies. At the same time these images have a destructive capacity – we consciously and unconsciously identify with the image appearing before us, more than with the actual ‘self’. This way of reinterpreting images is quintessential to postmodernism. The grand stories are no more. The belief in religion as well as in science (as redemption) has been tarnished. Man therefore looks for his own ‘grand’ story, a new interpretation of (the) truth. Rob Scholte does indeed not settle for a mere reinterpretation of the image, the re-experiencing in all its totality is imperative. He counts on us, as spectators, to experience the new composition as a revelation of the self: the re-birth of our own ‘self’ – the object identifying with the subject, not (anymore) the other way around. Not only the image itself relives, the spectator also gets to re-experience a situation from a certain past from which the image originated. Rob Scholte’s work is represented in many Dutch museums. Since 1982 he exhibited domestically and abroad, his works were shown at , among other places, Documenta and the Dutch Pavilion at the Venice Biennial in 1990. In 1994 he was the victim of a bomb attack and lost both of his bottom legs and knees. The perpetrator has yet to be arrested. The ‘Encouragements’ could, in this respect, be considered as a form of self-reflection by the artist. In 2013 he opened his own museum in Den Helder’s former post office, where he now also lives and works with his wife and children. Rob Scholte is considered to be one of the leading artists of the 20th century and possibly of our time. Dutch Artist Rob Scholte selected five of his 'Encouragement' works for the beautiful Chaplain Sacristy at the Cathedral of Our Lady in Antwerp.